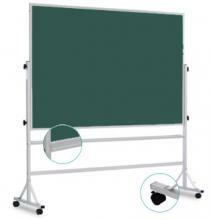 Economy Rolling Double-Sided Chalkboard with Aluminum Frame. This Double-Sided Chalkboard is reversible and rotates easily on an anodized aluminum frame. Locking casters (wheels) increase mobility. An extra-wide chalkboard accessory tray is included. Choose your Chalkboard size and color. This double-sided chalkboard is available in Green (recommended) or Black.